Denny Bautista was only able to give the Royals three innings tonight in his return to the rotation, but he was bailed out by another stellar Mike Wood performance. Bautista wasn't very sharp, throwing only 35 of his 60 pitches for strikes, and by the time he was lifted in the fourth inning, he wasn't anywhere close to the plate. Wood entered the game with the bases loaded and nobody out, and he successfully got out of the jam while limiting the damage to just one run on a sacrifice fly. This was the fourth time in Wood's last six outings that he's been called on for four or more innings of relief, and he's been nothing short of outstanding in that role. In those four appearances, Wood has pitched a total of 16.2 IP, surrendering only 13 hits, six walks, and three earned runs (1.67 ERA) while striking out ten. On the season, Wood now sports a 2.78 ERA in 22.2 IP, and he's become one of the most reliable pitchers in a bullpen that is once again starting to look like an asset. The key offensive contributors tonight were Doug Mientkiewicz, John Buck, and Esteban German. Minky's two-run single in the first brought home both German and Mark Grudzielanek, turning an early one-run deficit into a one-run lead. John Buck had a pair of hits, including his first homer of the season, a shot off the fountain retaining wall in left-center field. German also went 2-for-3 with a walk, scoring two of the team's four runs while raising his batting average to .447. This was the second straight game in which German's batted leadoff, which RC views as a very welcome development. 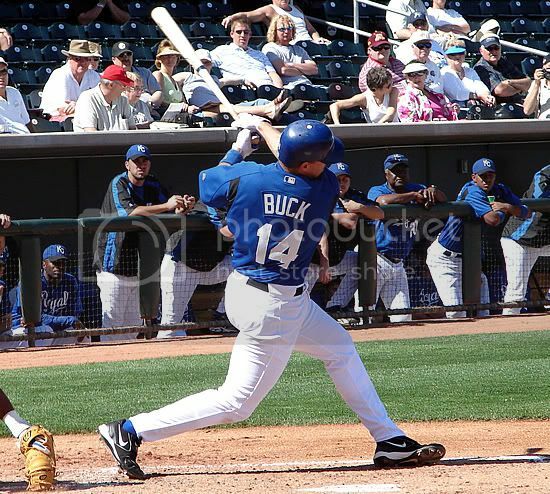 Buck slammed his first home run of the season on Monday night. The Royals tomorrow send out Jeremy Affeldt to oppose Cleveland's Jason Johnson, who's been struggling of late (27 hits and 15 ER allowed in last 18 IP) after a fantastic start. Johnson is the type of pitcher who the Royals have had their way with in the past, so RC thinks there's a good chance we could see another Royals victory tomorrow. As bad as the Royals have been on the road, it might surprise some people to see that they're only two games under .500 at home (6-8). 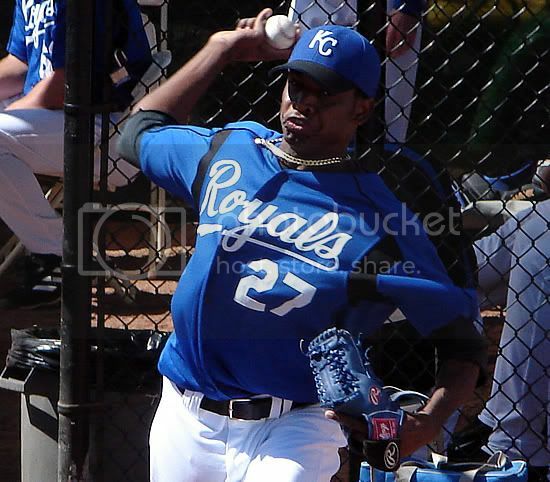 RC has to ask, just why in the hell is Justin Huber still in KC? RC supported the move when Huber was promoted last week, but we had falsely assumed at the time that he'd get at least semi-regular playing time. Instead, Huber has received exactly four plate appearances in the last week (1-for-3 with a walk), and he hasn't even come close to seeing any action at first base. This is completely unacceptable. Photographic evidence that Huber does in fact own a glove. RC is often able to find some logic behind even the most questionable Royals moves, but we come up completely empty on this one. If he's not going to play at all, then why is he here? As it is, Huber so far has lost about 25 AAA at bats, and that number is only going to climb as the Royals face nothing but righties for the foreseeable future. For the love of God, either play the kid or send him back! The present arrangement can only be described as supremely embarrassing, and the longer it is allowed to go on, the more embarrassing it gets. Anyway, that's it for today. We still owe you a Draft Prospect Update and reports on Chris McConnell (who hit his first homer today), Chris Lubanski, and Matt Tupman, and we promise to deliver them in the next couple of days. We've also got an announcement forthcoming about some new places where you'll be able to read RC's work, but we'll keep quiet on that for the time being. Perhaps one of Allard's biggest weaknesses is his inability to sell his "plan" to his coaching staff and Dan Glass. If it was Allard's intent to have Huber wasting away on the bench, well then he is a moron. But I don't believe that to be the case, I believe he has been unable to persuade Bell to follow his plan (in large part because he has been undermined by threats to his job security). But this is not new. Allard says all the right things - stressing plate discipline, throwing strikes, holding players accountable, getting quality for veterans at the trade deadline. But the results are far different. Part of being a successful GM is getting those above and below you to buy into your philosophies, and for as nice a guy as he is, and as hard working, Allard just doesn't seem to be able to do this. Agreed. Huber needs to be playing at the very least half of the time. Mientkiewicz, our number 3 hitter last night, I'm pretty sure is worse than every single hitter in the Indian's lineup. On the other hand, our starting rotation is looking surprisingly decent. Every pitcher in there has thrown at least two decent outings in the first month and a half, which is more than we could say at any time last year. Could we really win the series from the Indians again? Its gotten to the point where I'm absolutely elated if we take 1 of 3. 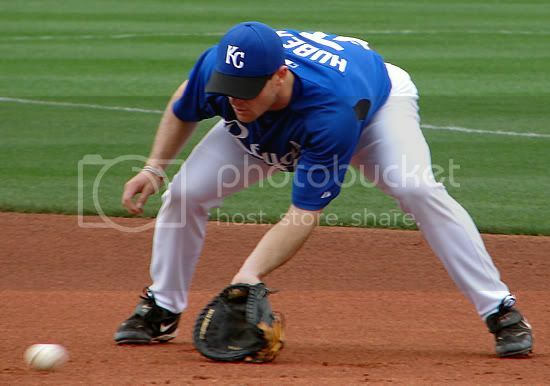 I went to both games in the Minnesota series and noticed that Huber recieved game like infield practice before both games. It's not enough work, in my mind, to justify his stay with the club. His bat on the otherhand needs to be in our anemic lineup. All Huber did in BP both games was lash line drives all over the dome. If anything put Stairs in the OF and get Huber's stick in the lineup. He couldn't do any worse than Guiel or Brown. I think you have to keep German in the leadoff spot, even when (if) DeJesus returns. David has always seemed like a better #2 hitter. I can't agree more with what's been said. Huber needs to be in the lineup. I like Mientkewicz at 1B, but play Huber once or twice a week there at least, keep giving him the suped-up infield practice, and get him in at DH about 4 times per week. German should stay at leadoff with DeJesus in the two-hole. I don't really like Grudz in the 3-spot, but he's probably the best option. Hey, guess who's on the bench again today? Justin Huber! BELL AND BAIRD MUST GO! ONE bad outing from Affeldt now..and Rotoworld is already saying he belongs in the pen. WTF!??!? LOL...guess his 0.50 ERA over his past 3 starts was nothing..ONLY THIS START MATTERS! Also awesome that rotoworld had Buck going 3 for 4 today....boy, I guess every box score that had him at 3 for 3 with a WALK was mistaken..lol. Boy, that rotoworld sure is retarded...lol.